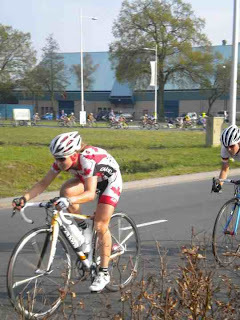 Today was the Ronde Van Gelderland in Appledorn. A UCI 1.2 race, 140 km long. Our awesome mechanic Julien was able to get my bike back up and running for today’s race! Luckily I had an extra derailleur hanger to replace the one snapped in two, and we were able to borrow a shifter off of another team. The spare biked worked well yesterday, but I definitely missed my Jamis! The field had a lot more Holland club teams compared to yesterday’s world cup, which only had the top ranked teams and some national teams. Some of the top teams traveled to another UCI 1.2 race down in Belgium today. It’s crazy that there can be TWO huge UCI women’s races, on the same day, that both have over 100 competitors, only in Europe! Unlike most of the flat recent races we’ve been doing, this course featured 5 climbs right in the first 50 km, and then finished flat. The course was backwards to that of last year, which had all the climbs at the end instead.I knew that the field would probably get split going through the climbs and twisty descents, so being at the front would be extremely important in that section (as always..). After getting through the 7 km neutral start, the race was on! I didn’t want a repeat of yesterday, so I wove through the pack and actually made it to the very front after about 10km, yay! I was in an awesome position going into the climbs, actually leading part way up the first climb. I stayed with the lead group all the way through the climbs and going into the flat section of the course. As I suspected, we lost a lot of people through the climbs, and unfortunately all of the Canadians due to some badly timed flats, mechanicals and getting stuck behind crashes. There was a small break that got away through the climbs, almost all of the top teams represented. The break did get brought back after awhile. Thankfully it wasn’t too windy out, so wasn’t too much guttering and the group stayed together. We finished on a winding circuit though the city. i just didn't have the energy to get myself up to the front to try and sprint, but I was happy to finish with the group. The sprint was won by Ina Teutenberg of HTC and I rolled in at 45th/ 180 starters. The drive back to Belgium felt so long after racing, but we did go out for the most delicious pizza at about 10 pm that lifted everyone’s spirits. Next race isn’t until next Saturday so now there is some time to re-energize the mind and body! Congrates on a great race.